0.5 mm precision settings beard and stubble trimmer Style your beard the way you want with this stubble and beard trimmer. Precision from as short as 0.5 mm up to 10 mm. Set the trimmer at the lowest position for a perfect stubble, just 0.5 mm long. Turn the wheel to simply select and lock-in the length settings you want: from a 3-day beard of 0.5 mm up to a full beard of 10 mm, in precise 0.5 mm steps. Rechargeable only.Up to 45 minutes of cordless power after 10 hours of charging. The light on the adapter is green when charging. of our grooming products are built to last. They come with a 2 year worldwide guarantee, worldwide voltage compatibility, and they never need to be oiled. 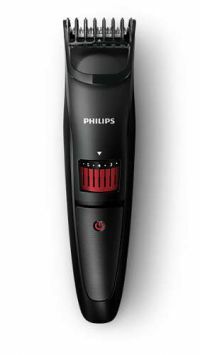 To Recieve updates and possible rewards for Philips QT4006/15 - Black please sign in. To Recieve updates and possible rewards for Trimmer, Clipper & Shaver please sign in.